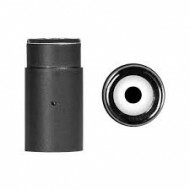 The Aurora Ceramic on Quartz Magnetic Atomizer employs dual titanium coils wrapped around ceramic ro.. The Aurora Quartz on Quartz Magnetic Atomizer employs dual titanium coils wrapped around quartz rods.. The Aurora Ceramic Halo Atomizer employs a wickless, coil-less ceramic heating element nested in an .. The Dr. Dabber Aurora is in stock at Doc's Smokeshop in Batimore, Md. Call 410-327-3676 t..
Dr. Dabber Aurora Vaporizer Pen. A single replacement Dr. Dabber Ghost attachment without mouthpiece. Please note that this is only t..